Last weekend, Josh Homme of Queens of the Stone Age was performing in Los Angeles when, while walking at the front of the stage, he intentionally kicked a photographer in the head. It was also reported that, later in the show, he purposely cut his own forehead with a knife. The photographer, Chelsea Lauren, was able to remain for the remainder of the night's performances but was later taken to Cedars-Sinai Hospital for treatment. She also said she planned on filing a police report. Homme apologized twice for the action, saying he was in the "lost in the performance" but later said "I've made a lot of mistakes in my life and last night was definitely one of them. I apologize for that to you. I want to be a good man but I think last night I definitely failed at that." 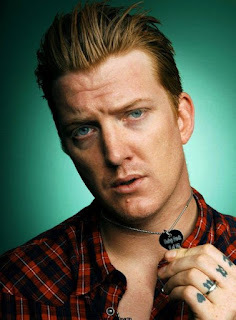 Jump to today (December 14) when Ellen DeGeneres was scheduled to have Will Smith and Queens of the Stone Age as her guest. Without explanation, Smith was the only guest on the program. There is no official word on the change; however, it may just be the start for Homme and the band. According to Stereogum, the BBC has also decided not to air Homme's appearance on their children's show Bedtime Stories.